Dog-friendly Put-in-Bay-Where we visited on this trip to Put-in-Bay: Miller Boat Line Ferry, E’s Golf Carts, Del Sol, Carriage House, Perry Park, The Keys, Perry Peace Memorial Visitor’s Center, Dairy Isle, South Bass Island Lighthouse, South Bass Island State Park. 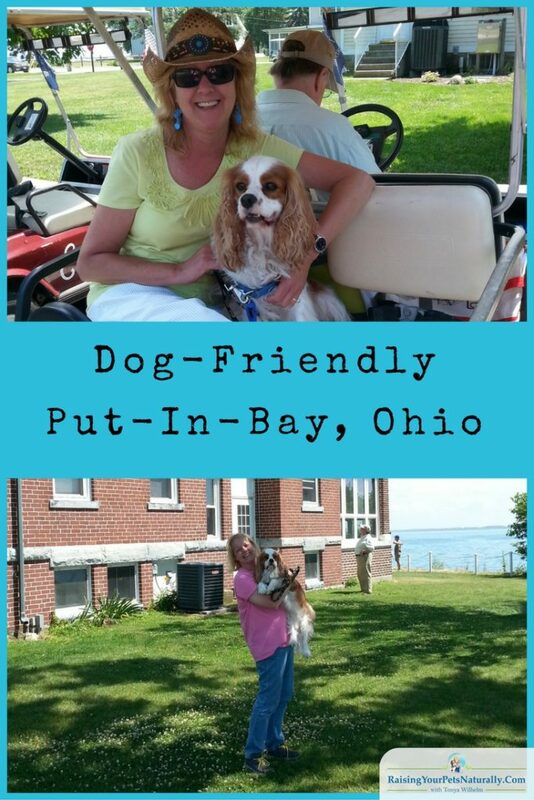 Our family had such a fun dog-friendly day at Put-in-Bay, Ohio. This was the first time I visited Put-in-Bay since my grade school trip. I’m not sure why it took me so long for another visit because we had a blast. I think Put-in-Bay just might need to be on a yearly dog-friendly adventure day for us. We started our dog-friendly trip to Put-in-Bay bright and early, and jumped on the Miller Boat Line Ferry. Yes, the Miller Ferry is dog-friendly! We had a great, relaxing ride to Put-in-Bay on the ferry. Dexter The Dog was a trooper as usual and sat patiently on my lap. 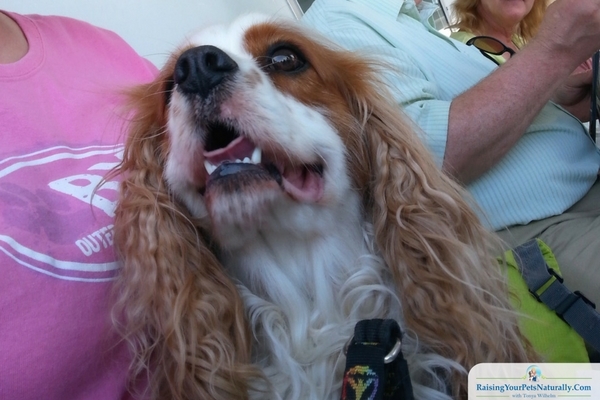 If you have been following our dog-friendly day trips, you might realize by now Dexter loves boat rides! Miller Boat Line Ferry offers some great discounts on Put-in-Bay activities, so check them out here! 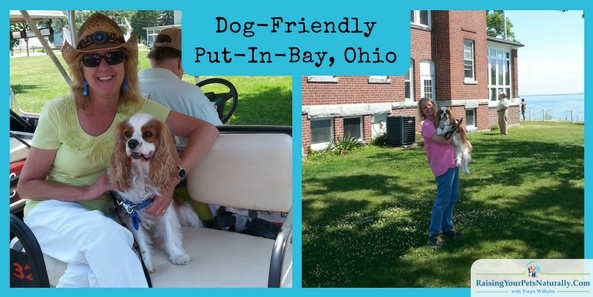 Once we arrived at Put-in-Bay we headed over to E’s Golf Carts to pick up our ride. 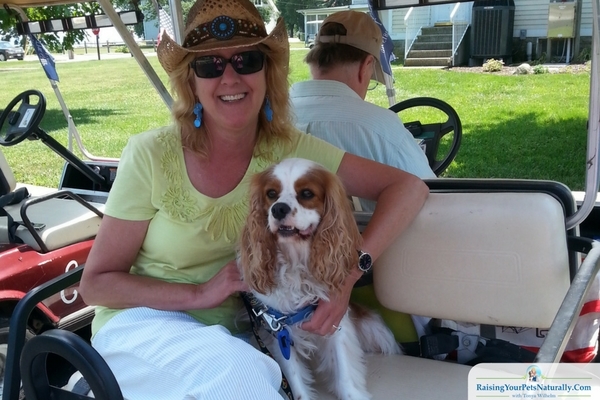 We contacted E’s Golf Carts prior to our arrival to ensure they were dog-friendly. No problems, of course. We were good to roll. We went uptown to all the area Put-in-Bay shopping sites. There were so many shops to choose from that we decided to just start at one end and work our way around the area. My step-dad was pretty excited to see Del Sol where all their items change color in the sun! I asked if Dexter The Dog could come in, they said no problem as long as he stayed close to me. My step-dad came out with a pretty hefty shopping bag full of Del Sol merchandise, so I think they made a good choice letting us in. Asking if Dexter could come into the shops was pretty much our theme for the day. We were pleasantly surprised at how many shops were dog-friendly when asked. We had to check out the Carriage House because they had so many dog-themed gift items! Luckily Dexter was welcome to come in and shop. Another great shopping experience. We left the store with some fun gifts. Unfortunately, they did not have the Cavalier-themed item I had hoped for. Maybe next year. After our dog-friendly shopping excursion in Put-in-Bay, it was time to let Dexter stretch his legs and get some good sniffing done. Luckily a great little park was right there in the shopping district, Perry Park. It was perfect, nice and grassy and clean. Although those Swift Birds were certainly getting Dexter a bit excited! After our little park stroll, it was time to get something to eat. Where to dine was a tough choice because there were so many restaurants that looked great. We took the advice from a friend and chose The Keys. No problem bringing Dexter the dog to the outside patio, which was right on the water! It was an amazing layout, and the food was wonderful. I ended up getting the Summertime Salad and it was so fresh my taste buds were very happy. 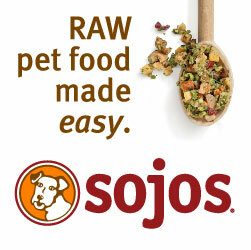 I’m thinking salads may be the way to go for dining out. After eating at The Keys, we decided to check out the Perry Peace Memorial Visitor’s Center. We weren’t sure about their dog policy (neither were they), so we asked. They said sure. It was nice to be able to get inside some air conditioning because the day was pretty warm. Up next, it was time for ice cream! A day trip isn’t complete without a dog-friendly ice cream cone. The Dairy Isle looked pretty tasty and had some nice outdoor seating with a cool sandbox for the children. If it hadn’t been so full of kids, I think Dexter might have enjoyed a little dig. We stuck with a simple vanilla cone for Dexter. Tasty and refreshing. 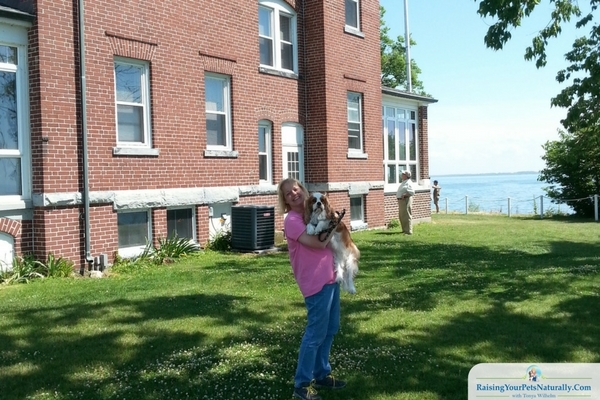 Next up was to visit South Bass Island Lighthouse. The inside of the lighthouse was closed, but we were able to walk around the beautiful grounds. It was quite a sight. We then headed over to South Bass Island State Park where we walked the waterline and the green fields. Dexter enjoyed getting his feet wet and watching the people frolic in the water. As the day drew to a close, it was time to head back to the Miller Boat Line Ferry. Our day trip had been packed with a lot of fun dog-friendly activities. There were so many more things we could have done, but we didn’t have enough time. Maybe next year we’ll look at staying a weekend. Have you taken your dog to Put In Bay? Tell me in the comments. There are not enough venues that have dog friendly facilities at least not here in Ireland. Most places that are fun themed for family days out are strictly NO DOGS ALLOWED. Great post! Ireland! Nice. 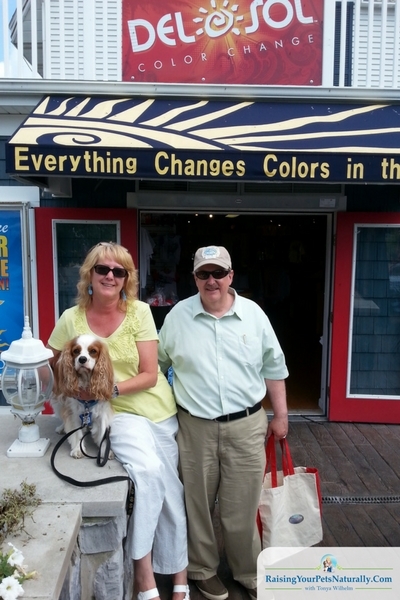 Yes, it can be challenging finding a dog-friendly attraction. Us dog folks just need to make sure we are being very nice and unobtrusive with a little pet etiquette. Hopefully, that will open the doors to more dog-friendly things to do. I have hardly made it out of my county, let alone Florida. I own a cat who does not wish to travel anthere except to his food bowls. Now, when I owned my snakes I took them quite a bit of places. Parks, events and such. A lot of the places we often visitem loved snakes. Snakes! That’s so neat that you took them. How unique. Hi, to George. Cat lover here too, have 2. I only would travel with Dexter. He makes the trip so much fun. Hi. Just Dexter and two cats. The cats stay home. We are actually hoping to go back to Put-in-bay for another dog-friendly trip. Aw what are your cats called and what breed are they? I would love to see them featured more on the blog! hehehe Nutter is my orange, domestic short haired cat. He has a few articles. Delilah is my mom’s domestic medium haired cat. The cats are a bit tricky to photograph. haha I did do a Facebook live training Nutter! A woman after my own heart .. we often plan places we want to go based upon them being dog friendly. It sounds like it was such a wonderful day. I couldn’t help but smile and laugh out loud at Dexter in the golf cart. What a sweetie! Thanks, Ali! It’s nice to meet you. One of my favorite things in life is to travel with Dexter. And he loves rides! Golf carts, boats, you name it. I love that more and more places are becoming “pet friendly” these days because it makes traveling with your pet so much more worth it. Thanks for this list of places, by the way! It’s much appreciated. Sure thing. I love traveling with Dexter. When places allow us, we really do appreciate it. 🙂 Makes the trip so worth it. It’s really hard to find a place for holiday where you can take you pet along with you. this is a great place, I must say. It does take some digging to find dog-friendly trips and activities. But, it’s so much fun when you can. Enjoy your holiday! I love this, I have been craving fo a dog for to add to y family, but I wuold feel bad as i work alot. but seeing places like this, makes me truly happy that people are supportive of those with pets. Yes, dogs are a lot of work and time. I’m so appreciative when places allow me to visit with Dexter. Your dog is so cute!! Such a pet friendly lovely place to visit. Spending a holiday with your dog is the best thing that cna happen!! Thank you. He’s pretty special. Yes, a holiday is not complete without Dexter. Thank you for posting this!! Taking my yorkie with us on our weekend getaway! It was very helpful!!! Thanks, Brandi! We are going back next month for Octoberfest!